Rescued Dog gets great home! Thank you to The Orange County Register for this great story. I just had to post it for others to read. HUNTINGTON BEACH 'He's so cute,' the 6-year-old boy exclaimed as he first caught of the sprightly, white Pekingese-Chihuahua mix licking and playing with the people who rescued him. The Westminster Animal Control officers who found the dog about three months ago in a local Dumpster - his limbs and muzzle bound tightly in Zip-ties -- called him Mr. Lucky. “He really was lucky to be alive,” said Karen Pickl, senior animal control officer. Thursday, Lucky hit the jackpot when Ben and Sandra Frascona came with their two boys, Jonathan, 8, and William, 6, to take Lucky back to their 3-acre ranch in Aguanga, Riverside. There, the dog, who is now full of life and has learned to trust human beings again, will run free with two other dachshunds, pot-bellied pigs, horses, cats and chickens. Ben Frascona, a Los Angeles County firefighter, said adopting Lucky was his wife’s idea. Sandra Frascona, whose husband calls her Dr. Doolittle, said the television footage of Lucky shown with his sad face, big eyes and bloodied ankles tugged at her heart strings. The family recently put down their long-time pet, a Lab, which was hard on all of them, Ben Frascona said. More than 200 people called the city after Lucky’s story was publicized, but only 20 families remained in the end. Pickl said the Frasconas were chosen because they had two young children who would love and play with this high-energy dog. On Thursday, Pickl wiped away tears as she tried to say goodbye to the dog who would “go nuts” when her car pulled up near the shelter. Lucky was first a little tentative as Jonathan tried to pet him. But soon, he started to lick William’s Spiderman shoes and rushed at Jonathan to be petted. “Aw, I love his bushy tail and bended ears,” Jonathan gushed. Pickl said she did not expect Lucky to recover completely. Officers have no leads on Lucky’s tormentor, Pickl said. As for the name, Frascona said they thought about it during their drive to Huntington Beach. 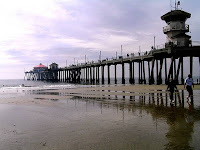 Check out the site now and find out 'where the locals go' in Huntington Beach! Slow Fish Cal-Korean Cuisine - 16051 Bolsa Chica St. This is the place I've been raving about. If you made it out to their ribbon cutting this past Monday you would have enjoyed a wonderful sampling of their food. Soju Cocktail on the house (a lemony flavored Korean spirit). Pancho Frijoles - 16635 PCH, right next door to Brix. This is the place for authentic tasty Mexican food! Buy one combo, get one 1/2 off. GolfTec - 7564 Edinger Ave. I've heard some pretty impressive things about these guys. If you golf, you'll want to visit them to improve your swing! 50% off initial swing evaluation. AR Mobility - 7923 Warner Ave. Ste B. Do you have any one in your family with physical challenges? Elderly parent who might need a scooter to help them get around? These folks are here to help. 5% any in-stock item. Cartridge World - 7088 Edinger (@ Goldenwest). Save a bundle on ink! There prices are already great. their coupon makes it even better. $2 off purchase. If you received the Clipper Magazine you'll find all the above ads in there. If for some reason you didn't, don't worry, you can also find these coupons in the COUPON SECTION of TheLocalHB.com Support your local Huntington Beach community and give these folks your business. Clip that Clipper Magazine!! And while you're looking for TheLocalHB ad, check out all the other valuable discounts in the Clipper!